Jim Radell Construction Company, Inc :: What is Directional Boring? Directional Boring, also known as Horizontal Directional Drilling (HDD is the most efficient method to install underground utilities. Directional boring eliminates the need for open trenching or open cutting roadways, reducing interruption to traffic and disturbance to landscape and existing surfaces. Horizontal Directional Drilling (HDD), also called Directional Boring and directional drilling, is a method of installing underground pipes and conduits from the surface along a prescribed bore path. Installation lengths up to 6500' have been completed and diameters up to 48" have been installed in shorter runs. Most installations are considerably shorter and smaller diameter. The process is used for installing telecommunications & power cable conduits, water lines, sewer lines, gas lines, oil lines, product pipelines and casings used for environmental remediation. It is used for crossing waterways, roadways, congested areas, environmentally sensitive areas and any area where other methods are more expensive or not feasible. Use of HDD is growing rapidly and is expected to continue to increase for the foreseeable future. When conditions do not allow a receiver to be positioned over the sonde or interference causes degradation of the signal, a more sophisticated 'downhole system' is used. The most commonly used type of downhole system is called a 'wire-line' and uses a wire to transmit the data up the inside of the drill pipe. At the surface the data from the wire is decoded by a computer to provide depth, angle, rotation, direction (azimuth) and other information. Gaining in popularity are newer downhole wireless systems which transmit the data through the ground via an electo-magnetic signal to a stationary receiver. To compensate for potential magnetic interference, an artificial electro-magnetic grid is created at the surface using what is called a Tru-Traker system. 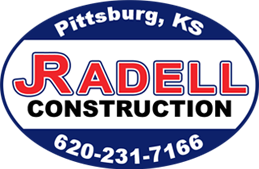 Jim Radell Construction Company, Inc. Copyright © 2019 JimRadellConstruction.com All Rights Reserved.